It probably won't come to any surprise to you that I find myself in a lot of friendly debates. Part of this is because I really value hearing different perspectives and challenging my own views. Part of it is because I am incredibly opinionated and stubborn. Anyway, while the internet has brought out the worst in antagonistic rhetoric by allowing people to throw profanity- and typo-laden comments at complete strangers under the cloak of anonymity, it has also allowed for much more productive exchanges. I have a couple of Facebook friends that I debate on a regular basis. One of them, Mason Wirsig (that links to his Facebook fan site, which is primarily political), is almost comically my political opposite. Seriously. He posted his I Side With presidential preferences results, and they are almost the polar opposite of mine on every single issue. That's not to say that we never find any common ground, but we usually don't remain on it long. 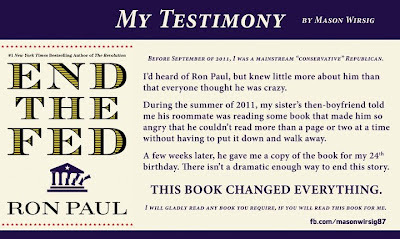 In exchange for reading Ron Paul's End the Fed, he agreed to read any book the reader required. While I am fully invested in head-to-head debates, I also really appreciate a debate that brings in the voices of their influences and support. While we often cite the people and statistics that influence us when we're arguing, in my experience it's rare that the other person actually reads those ideas for him/herself. Since most of our debates end up back on the fact that we aren't starting from the same primary concerns (his are primarily fiscal while mine are primarily social), I thought it would be good for me to experience one of his influences and see why that particular perspective is so important to him. In return, I struggled to find a book that summed up why issues of oppression and privilege are so important to every political debate I enter. 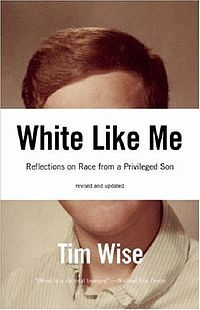 I finally decided--for a myriad of complicated reasons--to go with Tim Wise's White Like Me: Reflections on Race from a Privileged Son. I had a lot of books on the list as possibilities (bell hooks came to mind, some feminist essay anthologies, a critical race theory anthology, Ellison's Invisible Man), but I ultimately decided that the purpose of this exercise had to take into account the accessibility of my point of view as well, and I think that Tim Wise does a good job of laying out the principles of oppression and privilege in that way. 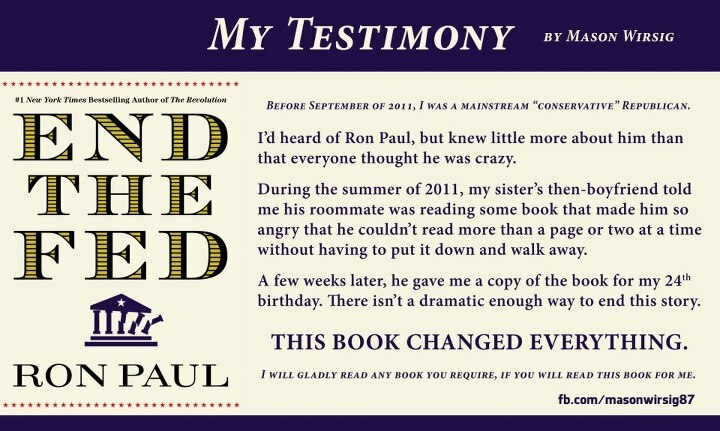 I've already completed my end of the bargain and finished End the Fed. While I agreed with some of the basic principles Paul starts with in the book, I mostly found it to be seriously lacking in practical application with glaring blind spots for social realities. Still, I'm glad I read it, and I think the project of expanding perspectives is a worthwhile one. We'll see what he thinks of my selection. If you had to pick a book that sums up your perspective on an issue that's important to you that would be accessible for someone who didn't see it your way at all, what would you pick? Read Atlas Shrugged. There is a lot of commentary about it in the media and in social circles so I felt like I should read it. Most of the people who comment on Atlas Shrugged haven't READ Atlas Shrugged. I think it makes the case of the problem with the end game of socialism. What happens when the people you expect to provide for others stop thinking that's a good idea? The more people that receive social aid and the fewer people that can fund that social aid eventually it crosses a tipping point. Fascinating project! Love the idea. I don't have much of a political book that I love, but I'd probably ask everyone to read The Omnivore's Dilemma. The problems with our food system are something I care about VERY deeply, and that book does an amazing job explaining it all in fairly simple terms. I started reading The Omnivore's Dilemma, but--at the time--my diet was largely based around packaged food and it was terrifying. I ended up reading Pollan's In Defense of Food and changing a lot of my eating habits (not necessarily because of the book, but the book did help inform a larger philosophical change toward food). I should probably re-read The Omnivore's Dilemma now. It's a great sort of catch-all primer on the food industry, and touches on it through a long narrative, which helps make it easier to swallow. I think In Defense of Food covers a lot of similar ground, just in a slightly simpler and less in-depth way. I find Pollan wonderful for many reasons, but one of the many is that he helps re-frame the ethical debate not as "vegetarians vs. carnivores" but in terms of the ethics of farming. So much good has come from that re-framing, even though it's still got a long way to go before it enters the mainstream.